with inquires regarding JCR/Honda or this email. Know anyone who might be interested in our newsletter?Click here to forward this email to up to 5 friends at once. 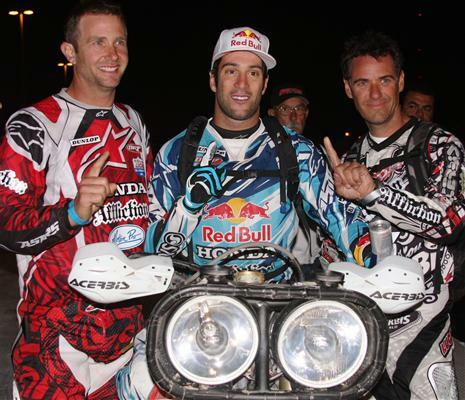 Big win at the 2010 SCORE Baja 1000, JCR/Honda makes it 14 in a row with a total of 21 overall wins for American Honda. Boosting over 300 entries from 19 countries, live crowds of a quarter million people and an international television package headlined by NBC, the SCORE Baja 1000 is the Grand Daddy of all Off-Road Races. The course is 1061 miles of the harshest terrain on the planet, leading racers on a crisscross journey from coast to coast down the famed Baja Peninsula from Ensenada, Baja California, to La Paz, Baja California Sur, Mexico. The JCR/Honda team averaged 55mph adjusted down from projections due to a 100 mile section of dense fog that slowed the pace of the race dramatically. The strategy for Kendall Norman and Quinn Cody was aggressive to say the least. Kendall Norman started the race 5th off the line and rode flawlessly to Race Mile 354 putting the bike in the lead. Quinn Cody would ride from Race Mile 354 into the evening. Quinn would eventually hand the bike off to Kendall at Race Mile 733 where he would ride to the finish at mile 1061. Both racers gave 100% with only one flat tire over the entire course resulting in a dominate lead and a great victory with a finish time of 19:20. JCR/Honda race support also supported several class winning teams which included: Class 21, Class 30, Class 40, Class 50, Class 60 and Class 24, making a total of 7 class wins for Honda. Proving once again, JCR/Honda Pit Program’s speed and dependability.